The English actor walked the red carpet at the latter ceremony alone. He stars in The Favourite, which won seven BAFTAs, including Outstanding British Film of the Year. Swift was later spotted with him at a post-awards dinner party. The singer wore a sleeveless, pale blue Stella McCartney dress. She later bundled up in a light blue wrap coat. "AHHHHH @thefavouritemovie just won 7 @bafta awards !!!" she wrote on Instagram, alongside a photo of herself. "Bout to go give some high fives - thanks @stellamccartney for this dressss." "SUPER CUTE!" The Sun's executive editor Dan Wootton wrote on Instagram, along with more photos of the two inside the party. 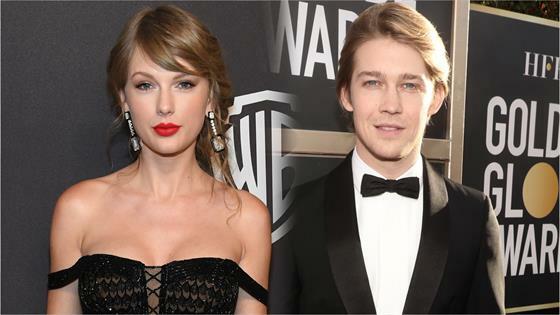 "Taylor Swift just snuck into the #eebaftas dinner and was very affectionate with her boyfriend Joe Alwyn on The Favourite table next door. The most affectionate they've been yet. #taylorswift." Swift and Alwyn have been dating for at least a year and a half. While the two have been spotted at celebrity events, they have yet to walk a red carpet together. They were last photographed together late last week, at a pub in northern London. E! News had recently learned that Swift would not attend the 2019 Grammys because she was in London, filming. She is playing Bombalurina in the upcoming movie adaptation of the hit musical Cats. Swift was nominated for one Grammy award this year—Best Pop Vocal Album for Reputation. Ariana Grande was announced as the winner in that category hours before the show began. She is also not attending the Grammys due to a disagreement with producers. Prior to this year, Swift had won 10 Grammys and was nominated for 31.